"Under the Overpass" is a simple book that changed the way I think in many ways. It is an account of two young college guys who decide to be "homeless" for a year in five major U.S. cities. During their year "under the overpass" they document the responses received by those with whom they cross paths. This simple book changed the way I see, and respond to, the homeless and destitute around us. Since reading that book, I have stopped ignoring homeless people. I challenge you, too, to stop pretending the scruffy guy outside of Safeway doesn't exist. He does. In fact, he is created in God's image. That could mess with your theology a little. In the mid-90's, I met 19 year-old Zero. Zero's real name was Jimmy. I met him while serving breakfast to the homeless in Avery Park, a well-known local park. It was a Friday morning, and I was visiting with Zero, asking about his family and his life...how he ended up in Corvallis, Oregon. He told me he didn't get along well with his father, experimented with drugs, and had now found himself on his own, with no resources. I asked him where he lived and he said his home was under the overpass just north of the park. Being curious and somewhat adventurous, I asked him if he would show me where he spent his nights. He was more than happy to share this part of his life with another human being, so we took off walking towards downtown Corvallis, across the railroad yard, and up the brush-covered side of the Highway 20/34 overpass. Zero moved aside a grimy piece of plywood, and there was a dark tunnel entrance in the dirt about four feet across. He went in head-first and immediately disappeared. I promptly decided I had made a serious mistake. I wasn't going into the hole. I heard him shout my name from inside the hole and decided that I could be a coward and risk ending this new friendship, or I could enter the unknown. I entered the Twilight Zone. As I slid through total darkness in this dirty tunnel under the highway, I seriously considered my sanity. What was I doing in a dirty hole under the highway? I was a respectable school teacher with a wife and children! I even attended church on Sundays! After what seemed like an eternity, I noticed some light, and eventually entered a small cave, directly under the median line of the highway! There was carpet covering the dirt floor, shelves carved into the dirty walls holding lighted candles, and various personal items scattered about the small room. Entering that little home under the overpass gave entrance into the tumultuous life of Zero. From then on, he would occassionally stop by our home, have a meal and play with our son, Jonathan. We would meet at the park for breakfast, and visit downtown near the river. Eventually, Zero found his way to our church and, most importantly he made peace with his Creator. Zero eventually returned to his New York home and restored relationship with his family. I lost touch with him for some time, only to find out a couple of years ago that his old demons had eagerly returned and had finally snuffed out his life. My friend was far too young to die. Being involved with Zero changed me in some small ways. I took a few steps towards those on the margins of society during my time with him. Then, as is often the case, the pressures of family, job, and outside interests pulled me away from those who live ignored lives under the overpass. The aforementioned book brought me back to memories of Zero and my desire to extend a hand to those in need. As I stopped ignoring the homeless and needy, something began to change within me. I no longer wanted to just buy a bag of food for the guy outside of Safeway. I wanted to visit and talk, hear their stories, and give some respect to the ones with whom Jesus would likely be spending his time. I wanted to bring others with me so they could experience the unique pleasure that comes from serving another without hope of recompense. That brings us to Friday night, January 18, 2008...New experience #2 for January. 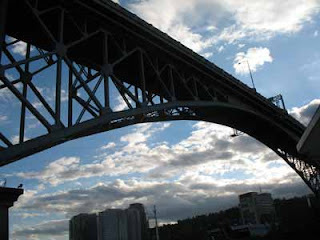 A group of 42 students and adults left for Portland at 4:30 pm Friday afternoon to partner with BridgeTown Ministries in showing the love of God to the homeless of Portland under the Burnside Bridge. After a brief meeting in a storefront across from the Portland Rescue Mission, we walked a couple of blocks through Portland's old town to the Burnside Bridge. There, we set up barber chairs, foot washing stations, clothing give-away stations, and tables for distributing and eating meals. And, they came. They came expectantly, hoping for some kind conversation, warm soup, maybe a haircut or a new pair of clean socks. I saw things I had never seen before...I had never seen one of my 8th grade students kneeling on the ground, visiting and washing the feet of a rough-looking homeless man. I had never seen several of our cute, clean, blond senior girls carefully and cheerfully grooming the greasy hair of some of Portland's street residents. I had never seen previously shy high students confidently approaching some scary looking street people simply to be a friend to them. It was remarkable in many ways. Every single participant shared how much they enjoyed the evening. Over the last few weeks, I have been considering why it is such a deep pleasure to wash the dirty little hands of children on the second Tuesday of the month when we volunteer at Southside Youth Outreach. Why is it that a sense of deep satisfaction washes over me when I buy a meal for a down-and-outer? Why would I rather be freezing under the bridge on a Friday evening when I could be at a first-run movie, or warmly tucked in my chair at home? Why are there so many people in our churches who are unfulfilled and dissatisfied? I won't say I have all the answers; but, I do think that I am beginning to understand a little about why serving others is so rewarding. First off, I do believe that the Bible is true. I will also say that some of our cultural interpretations of the truth contained in the Book are likely not really what God meant. The Book says that we are made in God's image. Either that is true or it is false. I believe it is true. There is a difference between me and a slimy, though interesting banana slug. If we look at the core of the Gospel; that Jesus came to earth to redeem sinful man, we see the incarnation of God dwelling among sinful man. We see Emmanual, that is, "God with us." We see the greatest story ever told echoing throughout eternity, pounding into the hearts of men. God cares. He loves us. He sees our sin and He loves us. In spite of my weakness He loves me. He loves me. He loves me. We cannot escape it. At the center of God's nature is His desire and plan to meet my need for redemption; a need that I cannot meet on my own. The coming of Jesus Christ and the cruel death He died on the cross demonstrates that God wants to meet my need. He laid aside His own comfort in order to meet my need. In forgetting His own comfort, and reaching down to man, He provided to us a picture of who He is. When we put aside our own comfort and do what we can to meet the needs of another, we are reflecting the very nature of God. Created in His image, we are actually functioning in the purpose for which we were created. That is reason we are so satisfied when serving others. Under the overpass is one of my favorite places. This is not what I had planned. 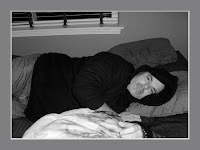 That's me in a semi-fetal position, out of my mind in pain, with Vicodin coursing through my veins! Ever since my kids were very small, my wife and I have piled them all into the old VW Van and traveled to the Oregon Coast for a few days during Christmas Break. What a great tradition! This year, with everyone on this continent; and, with Scotty having a new wife, we still kept the tradition alive and scheduled four days and three nights on Moolack Beach, north of Newport, for our glorious Christmas Break getaway! The morning of Wednesday, December 26th we were to leave; and, as I got out of the shower, I noticed my lower back was a little stiff. Then, getting into the car to drive to Newport, we went to a new level of discomfort. Upon our arrival, I realized I was headed for an entirely new adventure! Fast forward to Thursday morning...major pain. Not a little pain. MAJOR PAIN! MAJOR, OBCENE PAIN! Beginning with my 6:30 am wake up for a bottom fishing trip that didn't take place due to inclement weather; and, progressing throughout the day, the pain increased to unbearable levels. We're talking about staying in the bed all day in the fetal position while everyone else is downstairs enjoying the beautiful house and the incredible view. We're talking about making loud, involuntary noises while trying to turn on the bed. Finally, at 5:45 pm, when it became clear that this was no ordinary backache, my compassionate wife called our equally compassionate doctor who was kind enough to call in a prescription to the closet pharmacy. That brought me Vicodin...my first new experience in my crossing over! During this new experience filled with excruciating pain, I learned some things about myself! (Isn't that the purpose of new experiences?) I learned that I have been very fortunate in my first 50 years and I have not experienced obscene levels of physical pain as I did this week. I learned that I have not extended the necessary compassion so needed by those in physical pain, even though I am often thought of as a compassionate person. I learned that I have often made critical, inaccurate judgements about the choices people have made as they experience unusually high levels of physical pain. Would I do it again? Certainly not by choice! Am I a better person for this experience? You bet. As I said in my earlier post...I'm going to the forest in the morning and I am very grateful that I am able. Crossing over...strange term to use, isn't it? I think it actually makes perfect sense. I have crossed over from my 40's to my 50's and have now received an application from AARP. That is definitely crossing over! To the right you see my handsome self stopping in a scenic spot in Lisbon, Portugal, where I was privileged to travel this last summer. What does it have to do with crossing over? Plenty. You see, in my "crossing over" I plan to have adventures. I plan to do things I have never done, whether big or small. I plan to enjoy the daily things in my life I have taken for granted; the stable presence of my wonderful wife, the solitude of the forest across the road from my house, a latte with my beautiful daughter, the exciting new stages in my strong son's lives. 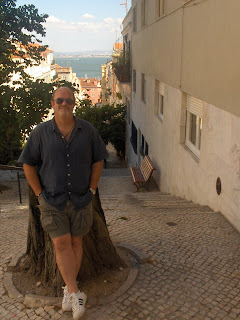 I plan to seek that which I have not yet experienced, just like my walk through the streets of Lisbon in June. I'll be working with students in the village of Juan Tomas, Dominican Republic, in March. I'll be able to travel again to Uganda in June. I'm going to the forest tomorrow morning.